A year's subscription to our daily reading bible notes for children. A year's subscription to XTB (four issues). Designed to help the reader get into the Bible daily for themselves - XTB is packed with puzzles, pictures, prayers and solid teaching points. 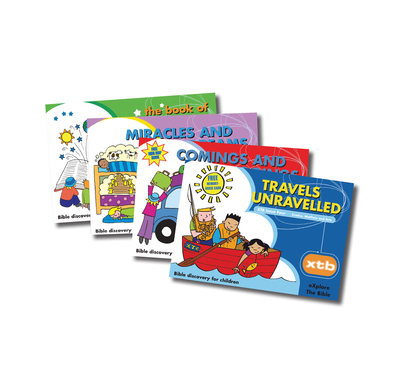 Children are encouraged to understand, apply and pray through the Bible in an accessible and thought-provoking way. We have used XTB with all of our children and found them helpful. We love the big picture of the Bible that comes through as a recurring them and the children have always enjoyed the activities. We strongly recommend these. I love this resource. We use it in our homeschool, and I think it’s so well pitched to this age group to get them reading the Bible. It gently introduces Bible study skills in a fun way. We love it! Excellent for reading with my 7 year old grandson for the first time. We have used XTB with two of our boys now and currently using it with our eight year old. He loves the puzzles and codes and is growing in his love of the Bible and his knowledge too. This is an investment in our children and I love the foundations it is giving them.